The USC Trojan Marching Band has always been known for getting some amazing opportunities to perform with their location being in Los Angeles. This has included performances at the Grammy's, Academy Awards, major festivals and locations around the world including their trip to Milan last year. Today they have departed for their 6th trip to China in the last 13 years! There week long trip will culminate with the marching in the Macao Parade for the Celebration of the Year of Monkey on February 10th. "In 2003 and 2004, the TMB performed in Hong Kong’s Chinese New Parade. 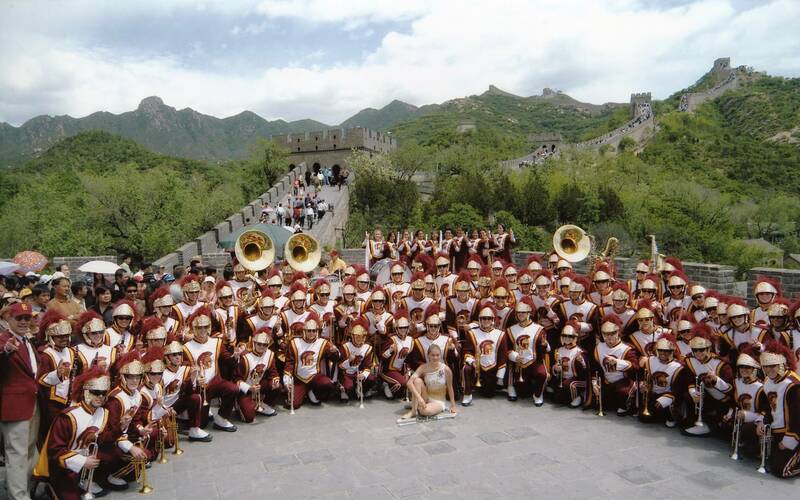 In summer 2004, the Trojans toured Shanghai, Xi’an and Beijing, where they played on the Great Wall of China. Since then, the TMB has returned to Shanghai twice, first in 2010 to perform for USA National Day at the city’s world expo and again in 2014 for the opening of the first Old Navy store in China." Director Arthur C. Bartner – now in his 47th year leading the organization – has taken band members to 18 countries on six continents. Wherever the Trojans have roamed, it is with the knowledge that they are ambassadors for both their university and their country.